Book hotel rooms online with us at Sol e Mar Hotel at the lowest rate, guaranteed. 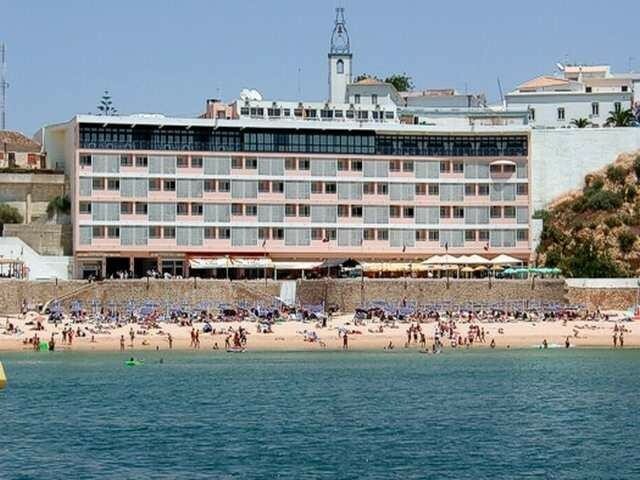 Get your holiday discount room rate at the 4 Star Sol e Mar Hotel located on the beachfront in the popular town of Albufeira in the Algarve. The complex has 74 comfortable bedrooms providing holiday accommodation from one adult to two adults. The Sol e Mar Hotel guests have the double special advantage of not only being able to walk from their hotel directly onto the sandy beach but also to enjoy excellent views of the ocean from their balconies. The bedrooms are air-conditioned have satellite TV and radio, direct dial phones, a safe and a refrigerator. Sol e Mar Hotel facilities include the restaurant, snack-bar, a bar and an indoor pool. The hotel enjoys such a good location it is only a few minutes walk to the centre of the village.